इस देवी के तीन नेत्र हैं। ये तीनों ही नेत्र ब्रह्मांड के समान गोल हैं। इनकी सांसों से अग्नि निकलती रहती है। ये गर्दभ की सवारी करती हैं। ऊपर उठे हुए दाहिने हाथ की वर मुद्रा भक्तों को वर देती है। दाहिनी हाथ की वर मुद्रा भक्तों को वर देती है. दाहिनी तरफ का नीचे वाला हाथ अभय मुद्रा में है जो भक्तों को हमेशा निडर, निर्भय रहने का वरदान देता है. शिव जी की बात मानकर पार्वती जी ने दुर्गा का रूप धारण किया तथा शुंभ-निशुंभ का वध कर दिया। परंतु जैसे ही दुर्गा जी ने रक्तबीज को मारा उसके शरीर से निकले रक्त से लाखों रक्तबीज उत्पन्न हो गए। इसे देख दुर्गा जी ने अपने तेज से कालरात्रि को उत्पन्न किया। इसके बाद जब दुर्गा जी ने रक्तबीज को मारा तो उसके शरीर से निकलने वाले रक्त को कालरात्रि ने अपने मुख में भर लिया और सबका गला काटते हुए रक्तबीज का वध कर दिया. Origin - Goddess Parvati, when she removed her outer skin to kill the demons, Nishumbha and Shumbha, at that point she became Maa Kaalratri. Maa Kaalratri is believed to be the most ferocious and fiercest form of Goddess Parvati. Goddess Kaalratri is the ruler of the Planet Shani. Goddess Kaalratri is worshipped on the seventh day of Navratri and is considered to be the seventh form of Mother Durga. Kaalratri is also known as Shubhankari. She has disheveled hair, fearless demeanor and a dark complexion. She possesses a set of three shiny bright eyes and emanates flames from her mouth. She rides a donkey and is considered to be the destroyer of ignorance and darkness. She is believed to be the owner and granter for siddhis, she is worshipped for siddhis, knowledge, power and wealth. Do kalash puja after adorning clean and fresh clothes. Invoke all gods and then start to do puja of Maa Kalratri. Maa is pleased with flowers of Red Champa. Offer Milk, Kheer or other sweet things to Maa Kalratri. Apply red sandal, Saffron, kumkum etc. as tilak on the idol of Maa Kalratri. Burn incense, aggarbatti etc. in front of Maa. The seventh day of Navratri has a great significance for Tantra Sadhna. The day is eagerly awaited by Sadhaks and Tantriks. All the evil powers such as demons etc. are scared by chanting of name of Maa. 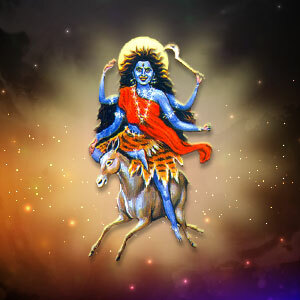 Maa Kalratri removes the planetary obstacles. Here Upasakas are devoid of fear from fire, water, animals, enemy, night etc. Her blessing remove all sorts of fears forever. To get rid of poverty sweets made from Jaggery should be distributed.